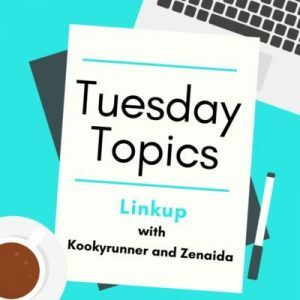 So I’ve been a little secret squirrel with my “training” posts. I knew what I was training for but didn’t want to make it whatever the blog equivalent of “Facebook official” is, because I wasn’t honestly sure if I’d start. 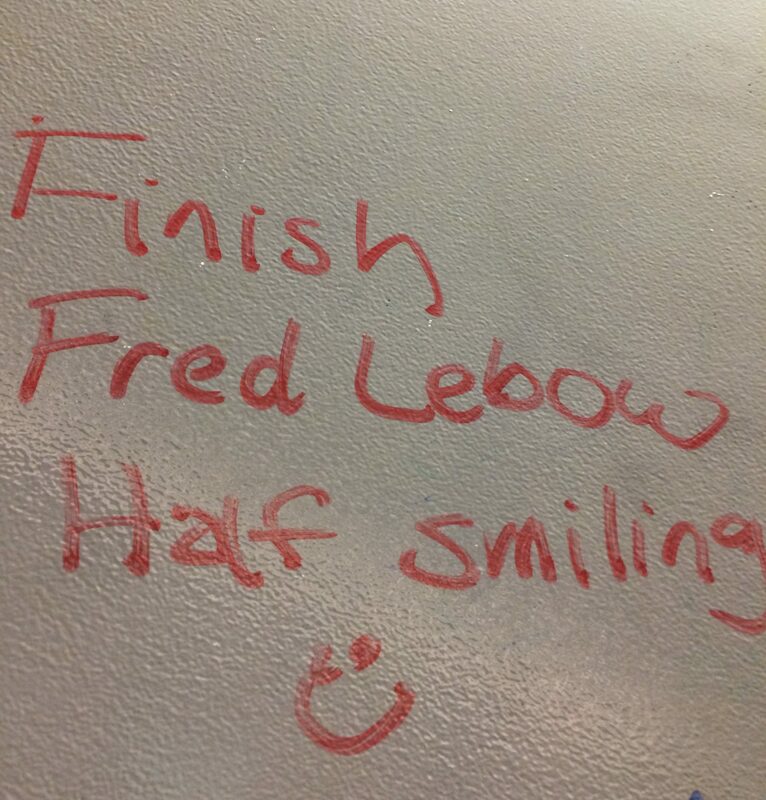 Or finish. 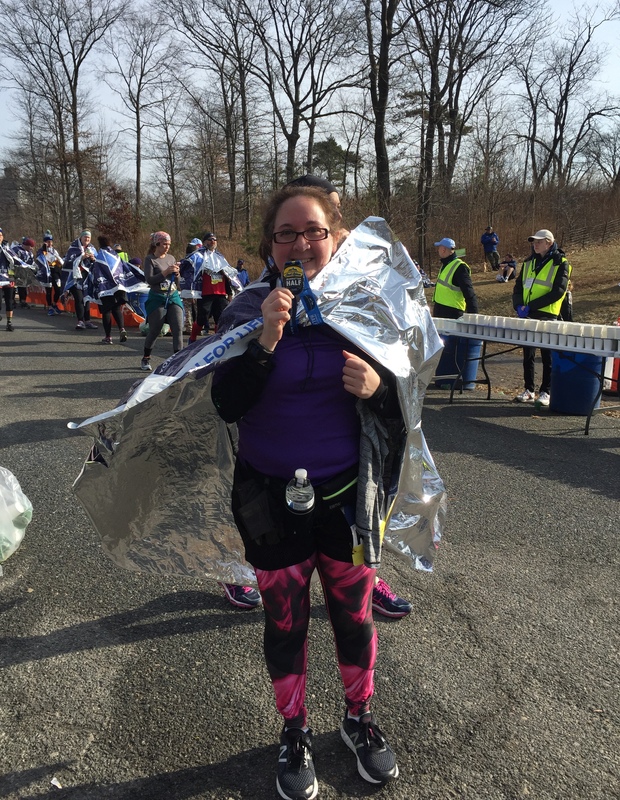 My first half marathon (!) came in somewhere between 2:40:59 and 2:41:16. Fittingly, my official NYRR time splits the difference. 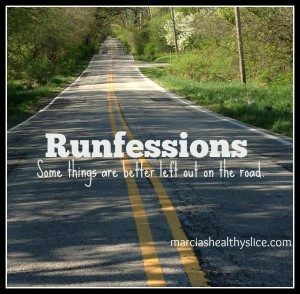 I decided this fall that if I was going to run a half, I wanted it to be on my home turf. 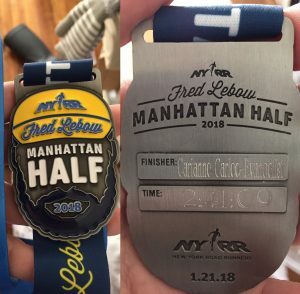 NYRR opened registration for the Fred Lebow Manhattan Half and since it was a course I knew inside & out and relatively cheap for a half, this was perfect. 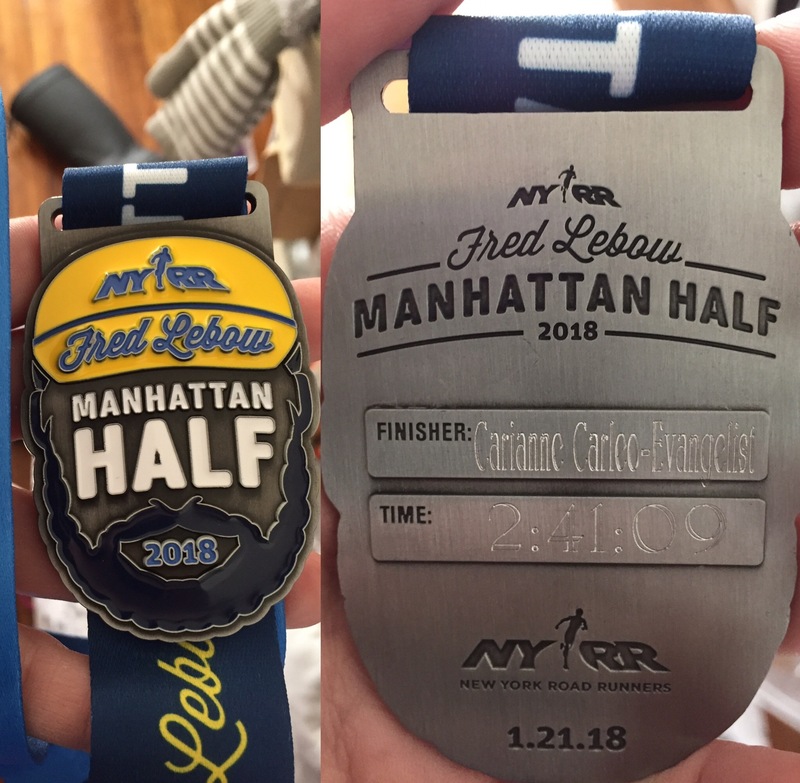 I was nervous because of the course (PDF), especially two trips around the Harlem Hills but I thought a race that was a tribute to such an NYC running legend was perfect for my newfound love of running. That it was so close to my running anniversary didn’t hurt either. I started training and it went well, but then it all went to pot due to work and then this crazy weather. The recent injury didn’t help. I was missing more workouts then I made. 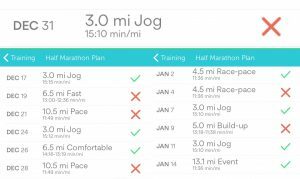 After December’s 15K, the only long run was for my one year runversary. 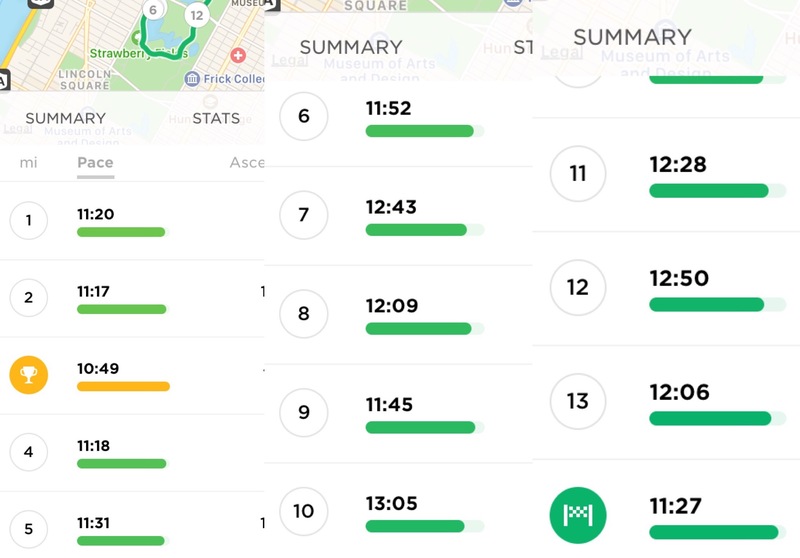 I’m so glad I finally tried and subsequently fell in love with Mile High Run Club because it was their High45 classes that got me through not being able to do hill training in Central Park. I knew I was undertrained and was determined not to be both undertrained and injured. The best thing about this course is that like every other Central Park race, I have an out. If I couldn’t, or just didn’t want to finish, I could just walk home. 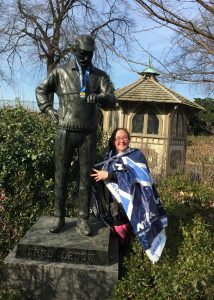 I started the race with the 2:30 pacers and hung with them until Harlem Hills when I knew that if I was going to finish I was going to have to ease up/walk some. I settled into a “strategy” of walking the water stations and I walked the 2nd lap of Harlem Hill. I surprised myself and “ran” the final Cat Hill after coming off the water station and planning to walk. 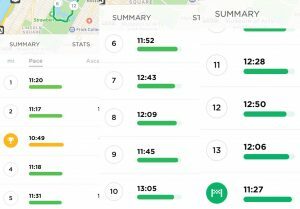 I was keeping an eye out for the 10K mark to eat a gel and that 1:12:22 is as close as I’ve come to repeating my first 10Ks (March, June) and wow, what an improvement. Oh yeah, training. 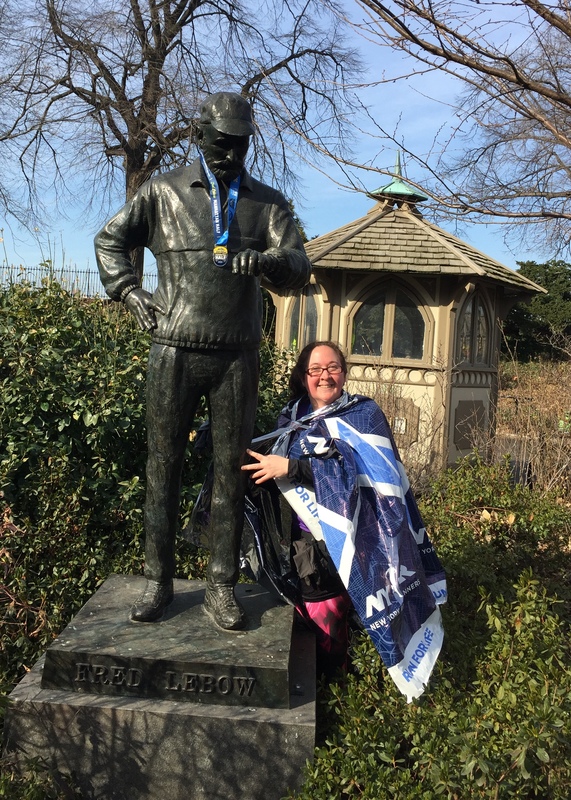 I can’t honestly say I want to do this race again, or the Shape Women’s Half as the hills (11 in total) are really brutal on your legs and maybe too much for a beginner, but I have until fall to make that decision about the Fred Lebow Manhattan Half 2019. 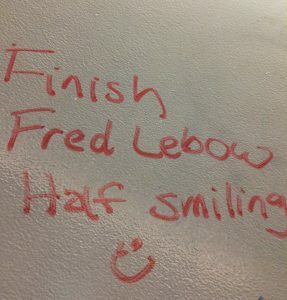 In the mean time I’ll think about how scary a Washington Heights 5K is vs. this. I have to say, the moment I broke out into a giant grin was when I realized I had only 5K left. That’s when I knew I had this. 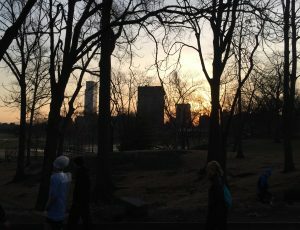 I definitely am not afraid of the Central Park 10Ks any longer, and look forward to those. So mission accomplished, times two. Overall, super pleased. I didn’t have a time goal. I wanted to finish smiling and I definitely did that. It felt good and overall it was an absolutely perfect first half. It was “warm” in January, the sun was out, and the other runners/crowd were great. 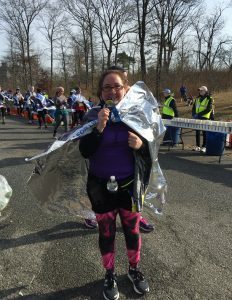 There were moments where I asked myself why I was doing this, and my walk to the subway to get my medal engraved was definitely way more shuffle than walk but I’m still smiling. NYCRuns’ Frozen Penguin, March 11. This was my first 5K and will be a year to the day from that race. 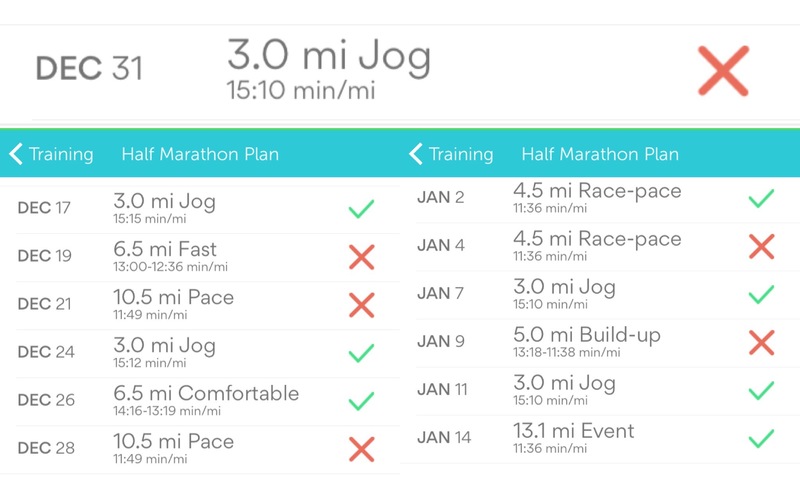 I don’t know that I’m doing enough speed work to lower my PR between now and then, but it will definitely be a PR on that course and 5K PR since my last race at that distance were each a hot mess in their own right in June and July. Cherry Blossom 10 Miler. This one is going to be fun. Other NYRR spring races TBD. I’m really not sure if I have any interest in the full marathon, but I may end up with 9+1 in case. More when I’ve digested this. Wonderful!! Faster than my first half and one of my others, not that that matters, but a good point of measurement maybe. I’m so proud of you!!!! As I read more running writeups, I realize I have no idea what a “normal” pace is. Especially with elevation. They’re really all over the map I also decided i didn’t care for this one. I just wanted to finish and not hate it. Accomplished both. i compare myself against myself, not anyone else (although I admit to a small rivalry with my brother in law over one local race …). And your first go at any distance is very much a fact finding and learning mission. You did so well!